Chinese people of Wa ethnic group reveled in their annual "Monihei" Carnival on Monday in the southwest province of Yunnan. Wa people and tourists from around the country joined the carnival, and they threw and smeared mud on to each other for the fun. "Monihei" literally means painting you dark. The Wa people adore the colour of black, taking it as the symbol of diligence and health. The mud "Niangbuluo" they use in the carnival are hence dark with plant extracts. They believe that the darker one gets in the revelry with the mud, the more blessings they will have in life. At around 14:00, tens of thousands of people gathered at the Monihei Square in the local Wa Ethnic Autonomous Prefecture of Cangyuan. After the traditional ritual of the Wa people, the "Monihei" revelry kicked off amid strong drum beats and the passionate dance by Wa women who swung their long hair to the music. 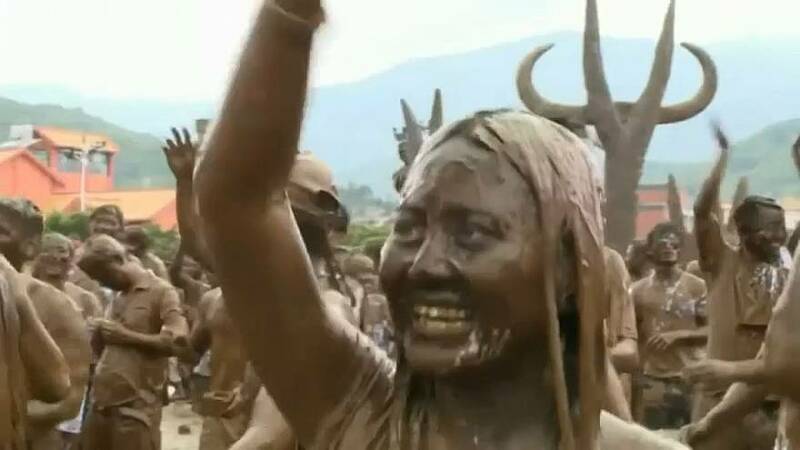 The revelers splashed and painted each other with the specially-prepared mud. Everyone was laughing and rocking, not caring at all about the dirt all over their body and face. One tourist said: "It's the first time I have visited the Monihei Square and joined the carnival. Extremely happy and unconstrained. And the Wa people are very sincere and enthusiastic." "This carnival is the happiest one I have ever joined," echoed another tourist.